Welcome to Green Street Books. Green Street Books is an online book seller with a large presence on multiple domestic and international platforms. A large part of our business model is working and participating in programs that directly impact and provide benefit to our own local community. Every one of the programs we participate in is open to verification at any time for any reason. We welcome and encourage any audit or verification of our statements and community non-profit work. •	Green Street Books is a for-Profit Corporation with a difference. •	Our operation proudly employs special needs employees working as a critical part of our daily operations. We are very fortunate to have a permanent work coordinator present at all times to supervise every aspect of work training. •	We facilitate multiple partnerships with non-profit organizations. Our partnerships provide non-profits an opportunity to increase income by over 50% over traditional funding methods. We are also able to offer a significant reduction in volunteer hours required while greatly increasing revenue. 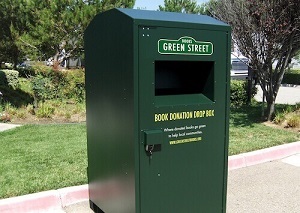 •	In 2014 Green Street Books also started an ongoing partnership placing free books through the “Big Lift” children’s library program. The program provides children’s books, in multiple languages, in low income areas on the San Francisco Peninsula and coast side. •	Green Street Books also provides books at no cost to prison facilities within California. Between 2013 and 2014 we successfully built the first much needed library at one of California’s three psychiatric prison units. Although not always viewed as the most popular part of our community work we believe strongly that if we are the catalyst in changing one life we have achieved our goal. •	We also provide books at no cost to active military personal and veterans, a very small gesture we can make for the sacrifices made by our armed forces and their families.